This article, written by Motoko Rich, was printed in the New York Times yesterday, June 9th. I didn’t agree with everything in it (I do think that when they are truly engaged in an activity, five year olds have an attention span much longer than 5 minutes.) 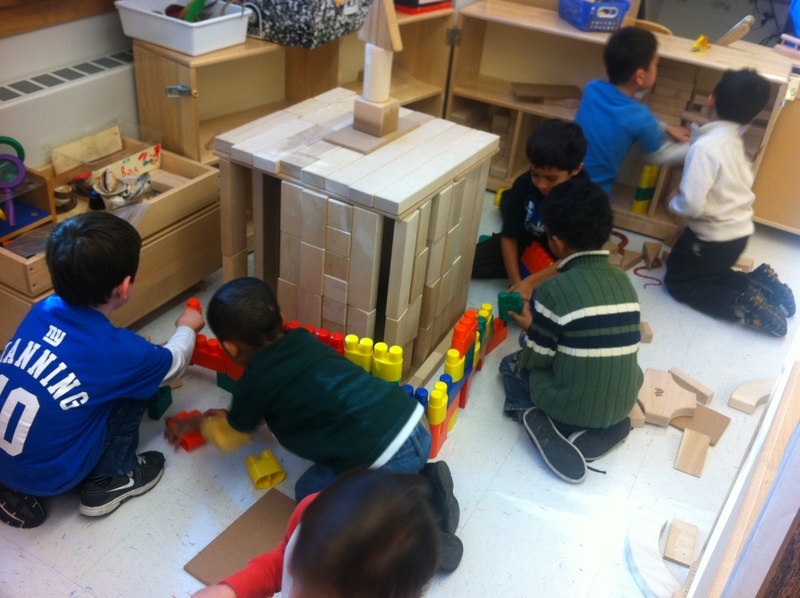 but generally, it was wonderful to see the NYTimes publishing an article about the importance of play in kindergarten. Finally! Perhaps common sense and an understanding of the social, emotional and intellectual needs of young children is returning! Like Anne Arundel County here, Washington and Minnesota are beginning to train teachers around the state on the importance of so-called purposeful play — when teachers subtly guide children to learning goals through games, art and general fun. Vermont is rolling out new recommendations for kindergarten through third grade that underscore the importance of play. And North Carolina is encouraging teachers to evaluate paintings, scribbles or block-building sessions, instead of giving quizzes, in assessing the reading, math and social skills of kindergartners. But educators in low-income districts say a balance is critical. They warn that unlike students from affluent families, poorer children may not learn the basics of reading and math at home and may fall behind if play dominates so much that academics wither. “Middle-class parents are doing this anyway, so if we don’t do it for kids who are not getting it at home, then they are going to start at an even greater disadvantage,” said Deborah Stipek, the dean of the Graduate School of Education at Stanford. Across the country, many schools in recent years have curtailed physical and art education in favor of longer blocks for reading and math instruction to help improve test scores. The harder work even began in kindergarten. Most recently, more than 40 states have adopted the Common Core, standards for reading and math that in many cases are much more difficult than previous guidelines. In some school districts, 5-year-olds are doing what first or even second graders once did, and former kindergarten staples like dramatic play areas and water or sand tables have vanished from some classrooms, while worksheets and textbooks have appeared. A study comparing federal government surveys of kindergarten teachers in 1998 and 2010 by researchers at the University of Virginia found that the proportion of teachers who said their students had daily art and music dropped drastically. Those who reported teaching spelling, the writing of complete sentences and basic math equations every day jumped. The changes took place in classrooms with students of all demographic backgrounds, but the study found that schools with higher proportions of low-income students, as well as schools with large concentrations of nonwhite children, were even more likely to cut back on play, art and music while increasing the use of textbooks. Experts, though, never really supported the expulsion of playtime. But educators point out that children are also capable of absorbing sophisticated academic concepts. M. Manuela Fonseca, the early-education coordinator for Vermont, said her state was trying to emphasize the learning value of play in its new guidelines. Still, teachers like Therese Iwancio, who works at Cecil Elementary School in Baltimore’s Greenmount neighborhood, where the vast majority of children come from low-income families, say their students benefit from explicit academic instruction. She does not have a sand table, play kitchen or easel in the room. “I have never had a child say to me, ‘I just want to play,’ ” said Ms. Iwancio, who has taught for two decades. In neighboring, more affluent Anne Arundel County, 321 kindergarten teachers last month attended training sessions on the new curriculum. Required each day: 25 minutes of recess, 20 minutes of movement, 25 minutes in play centers. The district is buying sand or water tables, blocks, play kitchens, easels and art supplies for every classroom that does not have them. Teachers were given tips on how to be more creative in academic lessons, too, like tossing a ball printed with different numbers to teach math. “We don’t think that rigor negates fun and play,” said Patricia J. Saynuk, the coordinator of early-childhood education. Traci Burns, who has taught kindergarten for the last five years at Annapolis Elementary School, said she was looking forward to retrieving previously banished easels. At Hilltop Elementary, a racially and economically diverse school in Glen Burnie, Melissa Maenner said she had found that teaching kindergartners too many straightforward academic lessons tended to flop. This entry was posted in Investigating Choice Time: Inquiry, Exploration, and Play on June 11, 2015 by Renee. THANK YOU so much for printing this article!! It makes my heart skip a beat with the hope that there is possibility that Kindergarten will return to the purposeful and playful environment it should be. I too, long for the days when art easels, building blocks, water tables, sand tables, song charts and exploration centers dominated the Kindergarten classroom. Young children come to school filled with inquisitive minds, ready and ripe for authentic and purposeful learning experiences. Yes, we want to offer children opportunities to reach their fullest potential. Yes, we want to be sure to reach those students who may lack rich learning opportunities prior to Kindergarten. And, YES, we can achieve those goals and so much more while placing our emphasis on the interests and developmental (academic, social, emotional, gross and fine motor) needs of the children we teach by integrating our instruction through a variety of modalities across a well balanced day of joyful learning. Thank you Susan. I feel like we need to keep this conversation going. For my upcoming book I’ve been visiting many early childhood classes. I’m so excited when I see rooms where children are cutting, pasting, painting, building and play acting. Then I feel so sad when I see rooms that have taken this away or limited it. I’m sad when I see a room where there is some sort of play happening but the teacher, rather than observing and interacting with children at their centers, takes a group to the side to do guided reading. It’s so sad and misguided. This satire is too close to the truth!